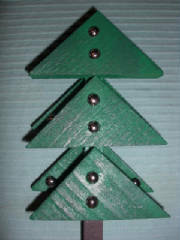 Put some extra holiday color in your yard, inside your home and on your patio with my Christmas Tree Stakes. 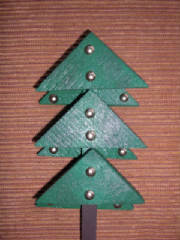 The tree is made with cedar wood and put together with nails and wood glue. Bright colorful tacks dress up the tree for ornaments. Just like my birdhouses, no nail holes show and they are made to last. Hand-painted with exterior paint. The tree will add holiday beauty and color to your garden, plants or as an accessory piece in your home, office or back yard. 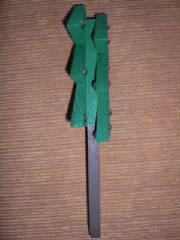 Height 12", tree height 6.5", width 4"
Special orders can be made with any colors you request.